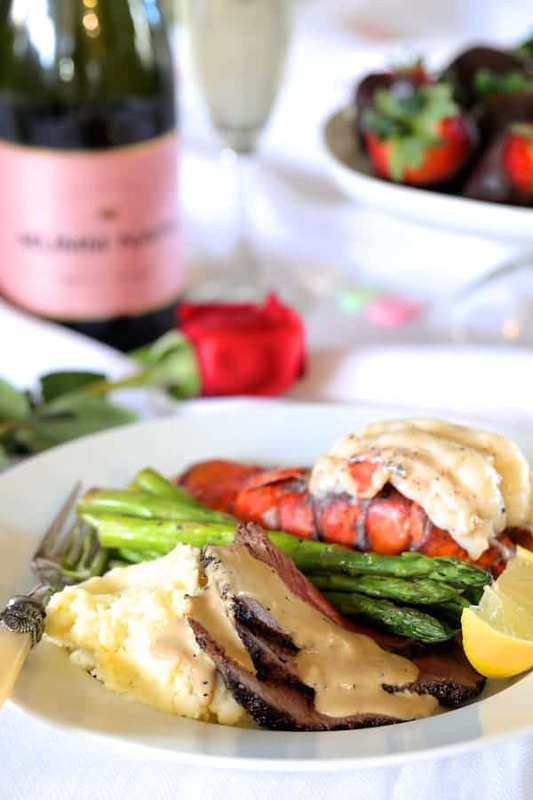 Steak au Poivre and Broiled Lobster Tail with Roasted Asparagus, part of The Fresh Market’s Valentine’s Day Meal is the perfect way to celebrate Valentine’s Day! Here, their Premium Choice Chateaubriand Cut Filet Mignon and North Atlantic Cold Water Lobster Tails combine for an elegant, romantic meal you’ll both love! This shop has been compensated by Collective Bias, Inc. and it’s advertiser. All opinions are mine alone. #MyTFMValentine #TheFreshMarket #CollectiveBias This content is intended for readers who are 21 and over. 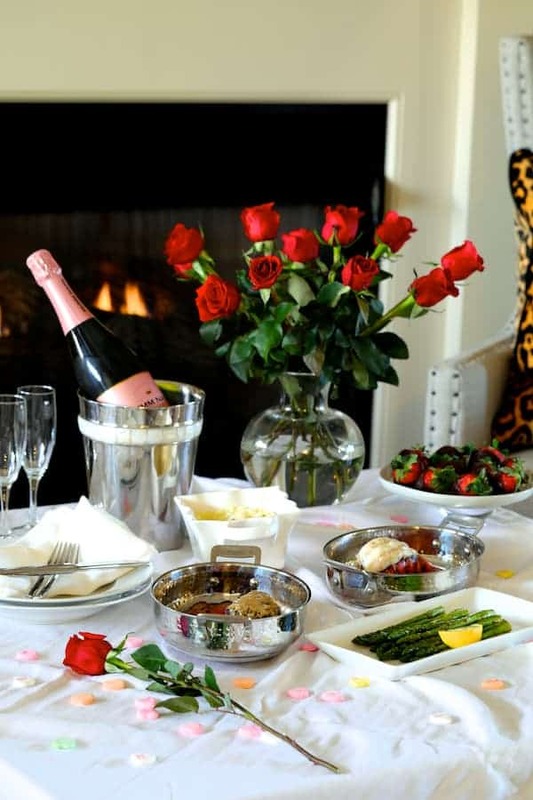 Are you stressing about how to pull off a beautiful, romantic Valentine’s Day meal with your sweetheart? Did you try to make reservations at your favorite restaurant only to find they’re already booked solid? Wish you could whisk your loved one away to a bistro in France for something unique? Don’t stress any longer! You can whip up a lovely bistro-inspired meal at home with the help of The Fresh Market. 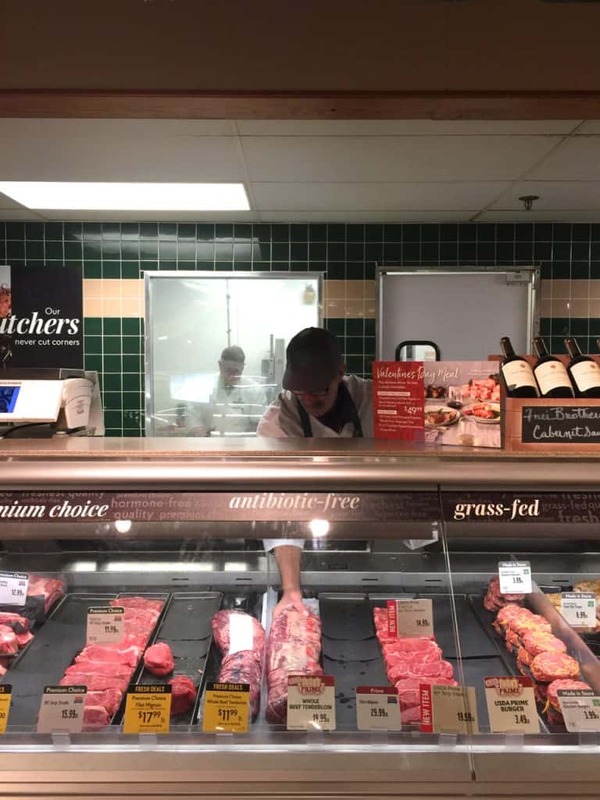 The Fresh Market is a specialty grocer of curated, exceptional quality foods made with the finest ingredients. When you walk in, you’re greeted with friendly service in a warm and inviting atmosphere. From seasonally fresh produce to exceptional meat and seafood, signature baked goods and carefully curated organics, all the foods you LOVE are waiting for you at The Fresh Market. Everything is fresh and delicious! 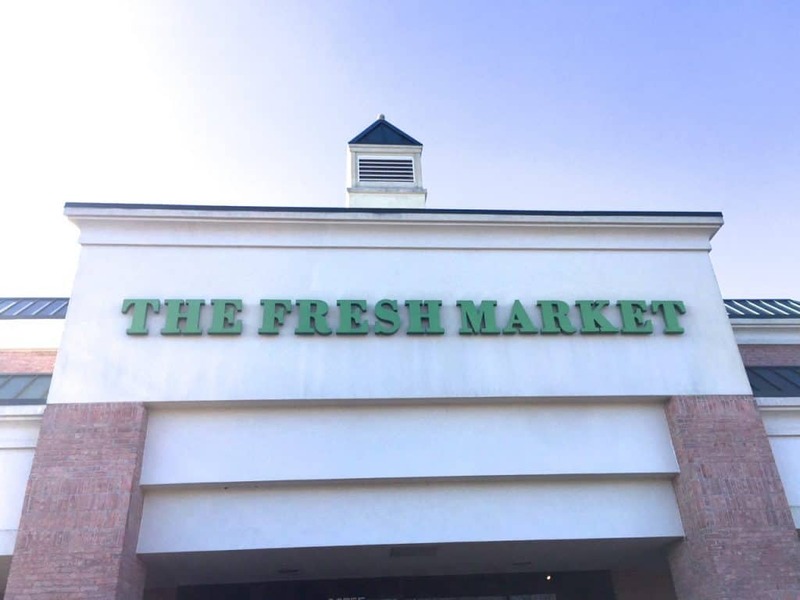 The first location of The Fresh Market in my area opened almost 16 years ago. 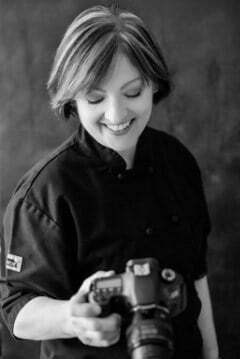 I remember it well because I began my personal chef business around the same time. I visited the store shortly after it opened and left feeling discouraged about the potential success of my fledgling business. The Fresh Market had so much to offer! I wondered who would need a personal chef when all they had to do was shop at The Fresh Market! 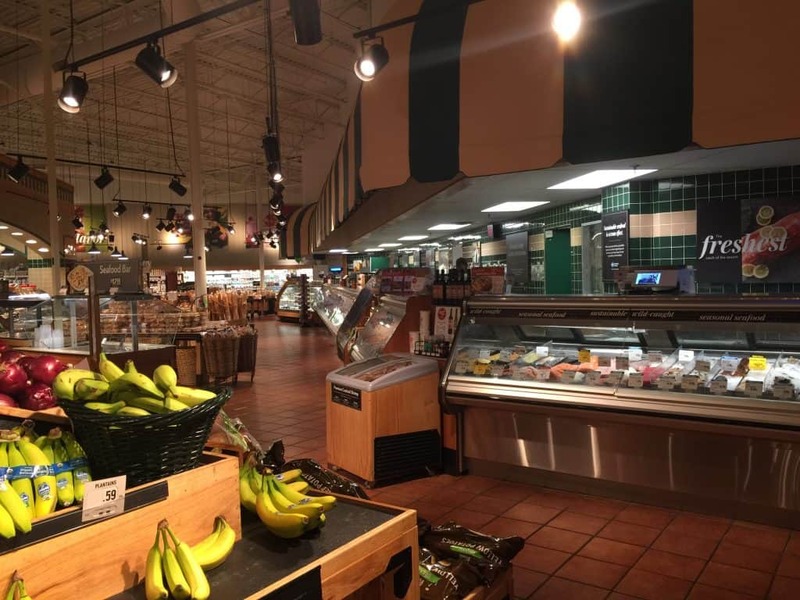 What I soon found out was I would not be able run my business without The Fresh Market! I shop there as often as four times per week for my customers and for myself. All I do is call in my meat, seafood and poultry order and it’s ready when I arrive. 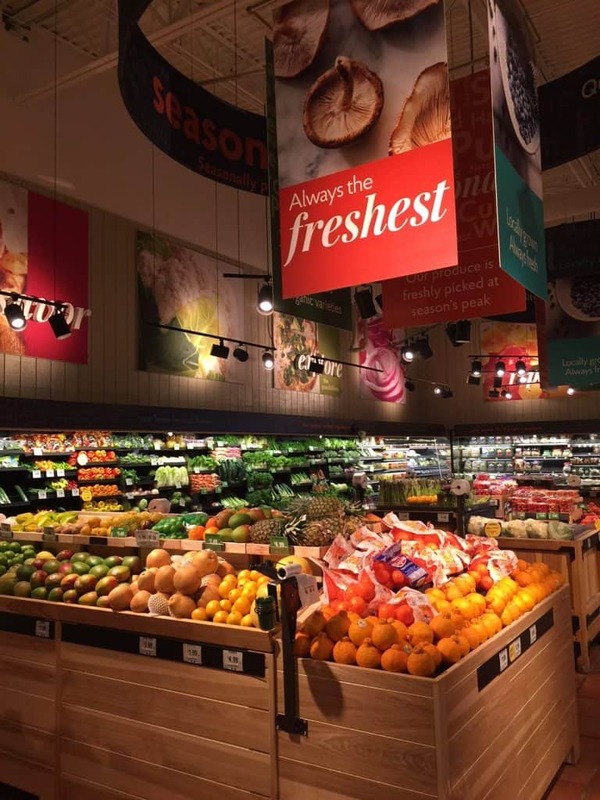 I am a HUGE fan of The Fresh Market! Of course, not everyone can afford a personal chef. 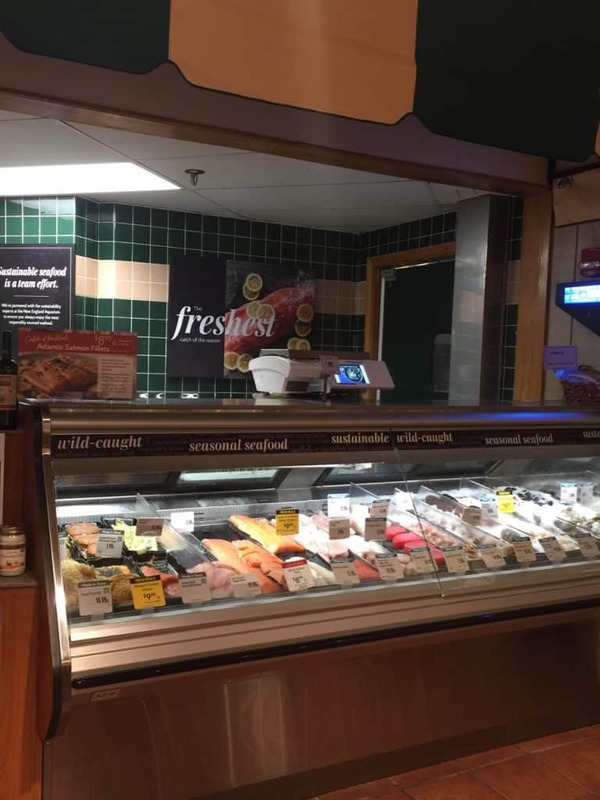 The Fresh Market offers a thoughtful and innovative range of meal solutions perfect for any dining occasion or cooking ability. You and your guests will love discovering all the new flavors they offer! Find a store near you by visiting their store locator. 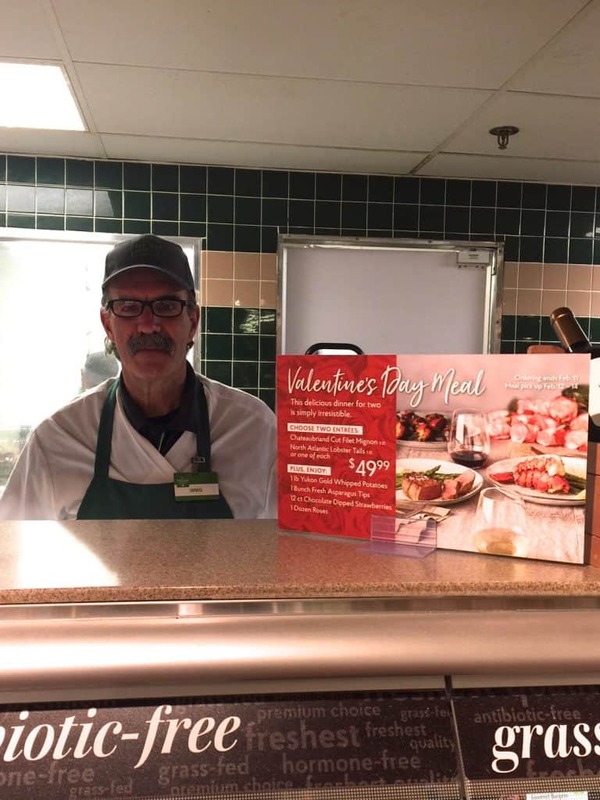 Here’s another exceptional meal solution from The Fresh Market: The amazing Valentine’s Day Meal! 2 Premium Choice Chateaubriand Cut Filet Mignons. Each is carefully selected from the center of the tenderloin roast for tenderness and the best flavor. Each filet is a minimum of 9 ounces. 2 (5-ounce) delicately sweet, smooth and velvety North Atlantic Cold Water Lobster Tails. 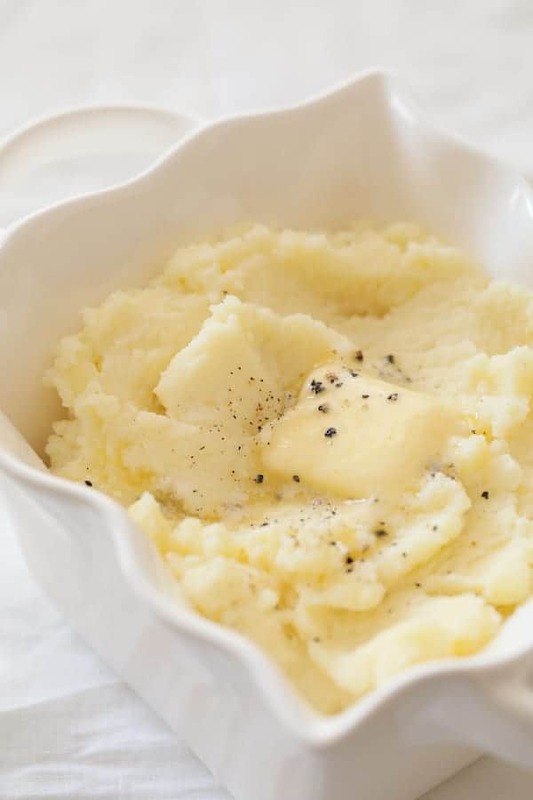 1 pound of Yukon Gold Whipped Mashed Potatoes that are made with real cream and butter. This rich, creamy and traditional side dish comes pre-cooked, delicious and ready-to-eat. I pride myself on making great mashed potatoes and I can honestly say– These. Are. Good! 12 Chocolate-Dipped Strawberries. 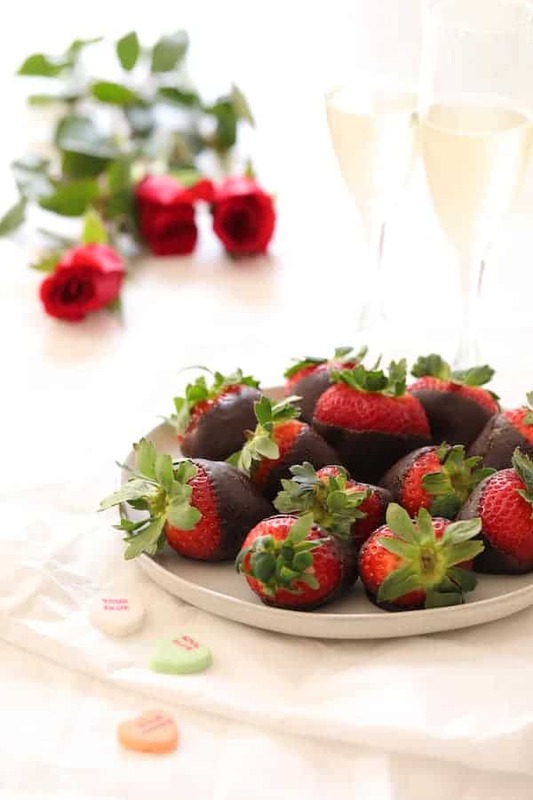 Beautiful, fresh strawberries dipped in decadent dark chocolate. 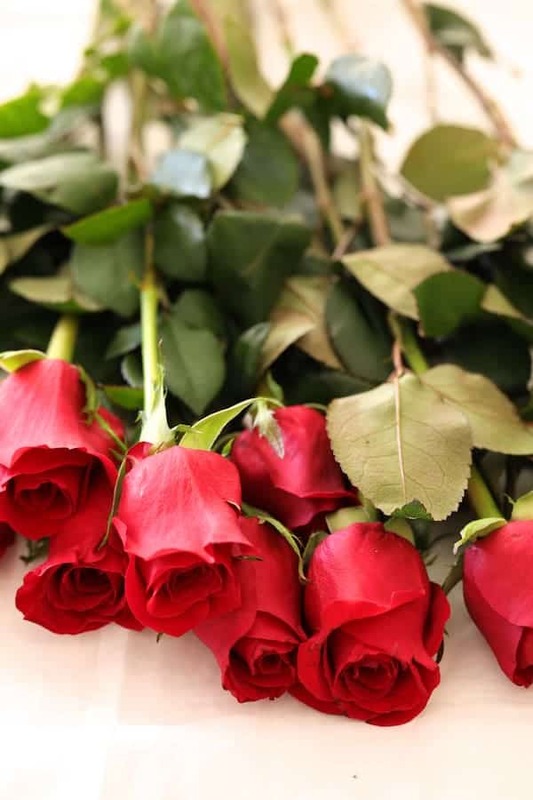 1 dozen beautiful, fresh-cut roses. Choose from a variety of colors! All this for only $49.99! You can order online or in-store. Orders for these kits will be taken through February 11th and can then be picked up in-store February 12th through the 14th. For more information, visit their Valentine’s Day Meal page. Now to tell you about this lovely meal you’ll be able to pull together easily–Steak au Poivre with Broiled Lobster Tail and Roasted Asparagus. First, you’ll need to do a little prep work with the lobster tail before anything else. 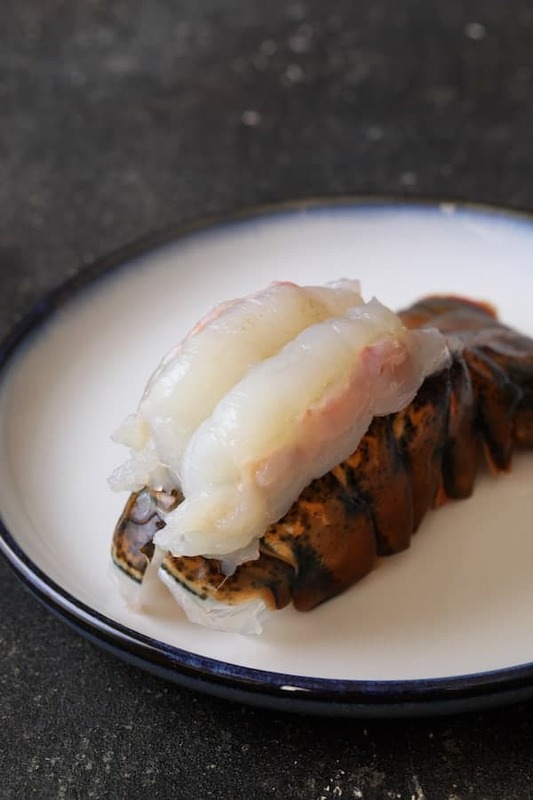 For a classic preparation, carefully cut through the top of the length of the shell with kitchen shears then gently pull the lobster meat up and out, leaving the meat attached at the end. A small spoon such as a teaspoon is helpful in detaching and prying out the meat. Place it in a roasting pan, season with salt and black pepper and drizzle with lemon juice and butter and set it aside for a bit. Then, work on the steak. 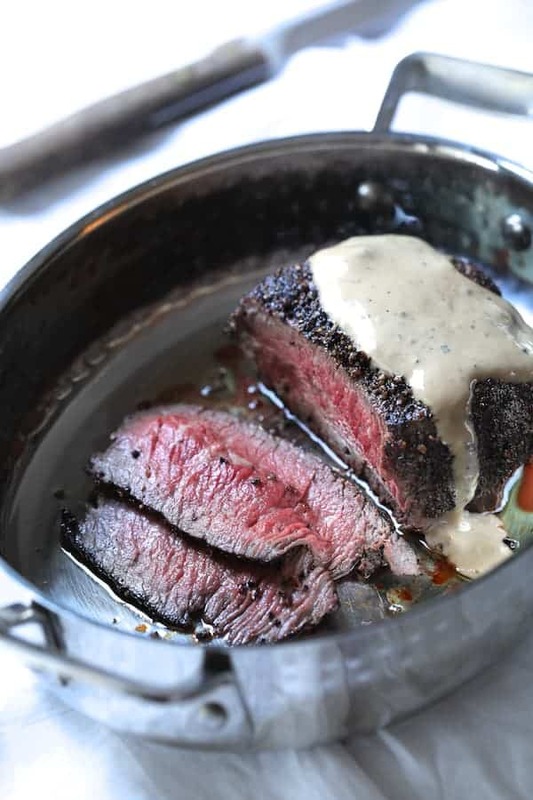 Steak au Poivre is a classic French bistro dish. The origin of Steak au Poivre is sketchy at best. Legend has it originating in the bistros of Normandy in northern France where politicians and aristocrats took female companions for a late supper of this dish because it was believed black pepper had an aphrodisiac effect. 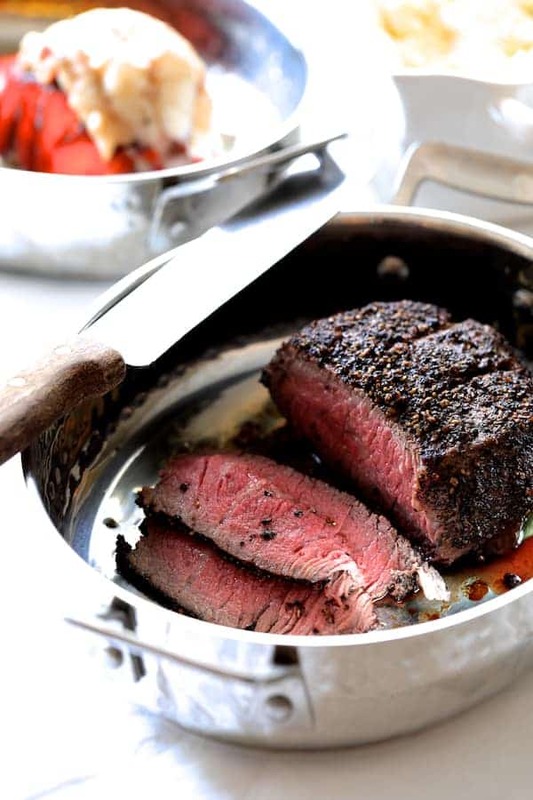 Steak au Poivre is traditionally filet mignon, prepared by coating it with coarsely crushed black peppercorns before cooking. The peppercorns add pungency to the richness of the beef and the cognac-laced cream sauce that accompanies it. 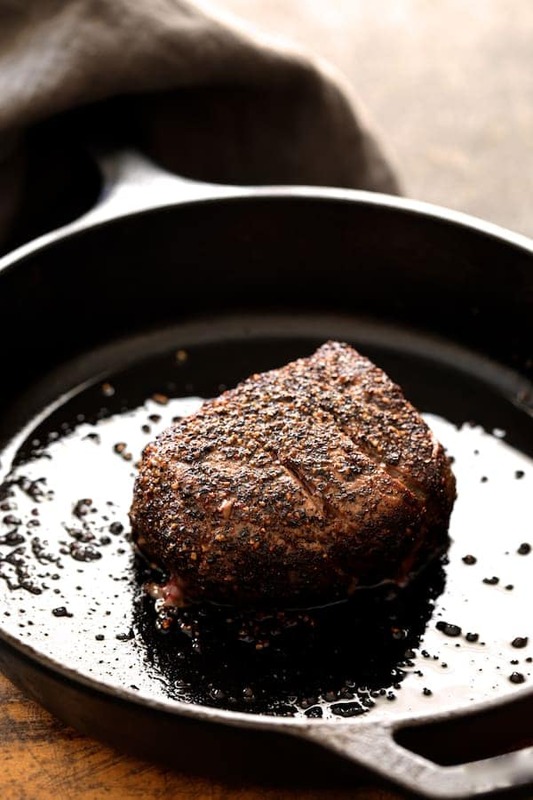 After seasoning the chateaubriand cut and coating generously with crushed black peppercorns, sear it well on all sides. Transfer to a small roasting pan and place in the oven to continue cooking while preparing the sauce. 10 to 12 minutes at 450 degrees after browning on all sides will give you a lovely rare steak that’s perfect for the chateaubriand cut. Approximately 15 minutes will produce a medium result. With experience, it’s possible to estimate doneness simply by pressing down on the steaks. If they’re soft to the touch, they’re close to rare. If they yield slightly to the touch but are beginning to feel firm, they are close to medium. The best way to tell doneness is always with a meat thermometer; 130 degrees is rare and 145 degrees is medium. There will be a small amount of “carryover” cooking which means the temperature will continue to rise slightly as the steak rests so you’ll want to account for that. If using a meat thermometer, may I suggest inserting it into the side of the steak. Creating a hole in the top will cause some juice to escape and will ruin the lovely peppercorn crust. Adding cognac (which is high in alcohol) to a hot pan can be tricky. Generally, you ignite the cognac to burn off the alcohol but not this girl! Lighting anything on fire makes me nervous so I don’t do it. Instead, after searing the steaks and transferring to the oven, I take the pan off the heat, wait a moment or two, then add the cognac. I bring it back to a boil and let it cook a minute or two before adding the other ingredients to complete the sauce. 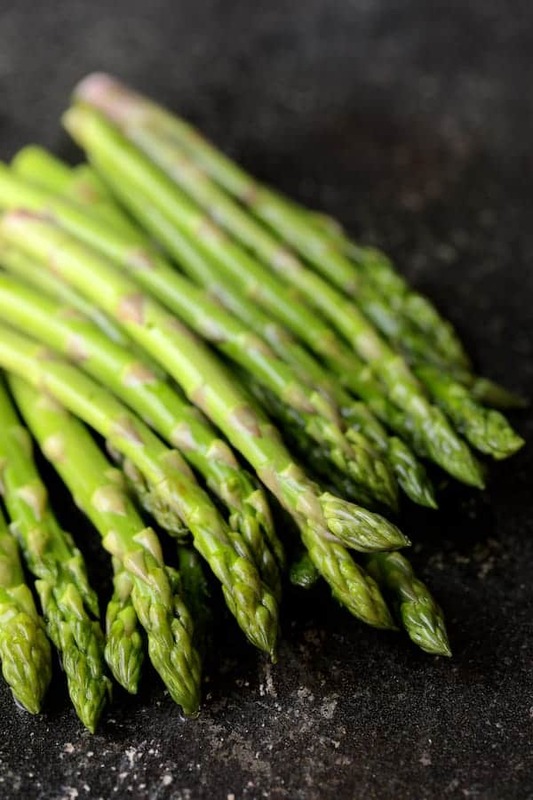 Have the asparagus ready to go and you can roast it alongside the beef. After roasting, cover the asparagus to keep it warm. Also, tent the beef with aluminum foil so it rests and the juices redistribute. Immediately heat the broiler. 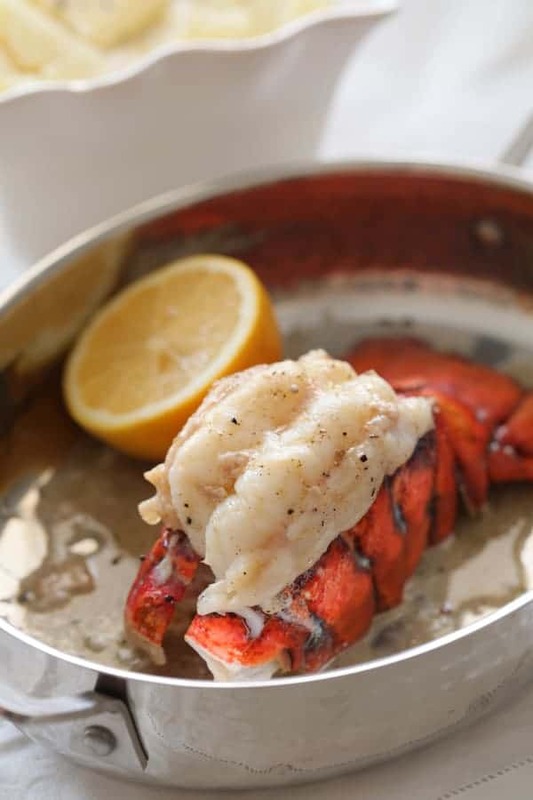 Place the lobster tail under the broiler and broil for five to six minutes. And that’s it! …And enjoy some serious romance! Steak au Poivre with Broiled Lobster Tail and Roasted Asparagus! All made easy with the help of The Fresh Market! Find a store near you with their store locator and visit their Valentine’s Day Meal page for more information! Have a happy and beautiful Valentine’s Day!!! 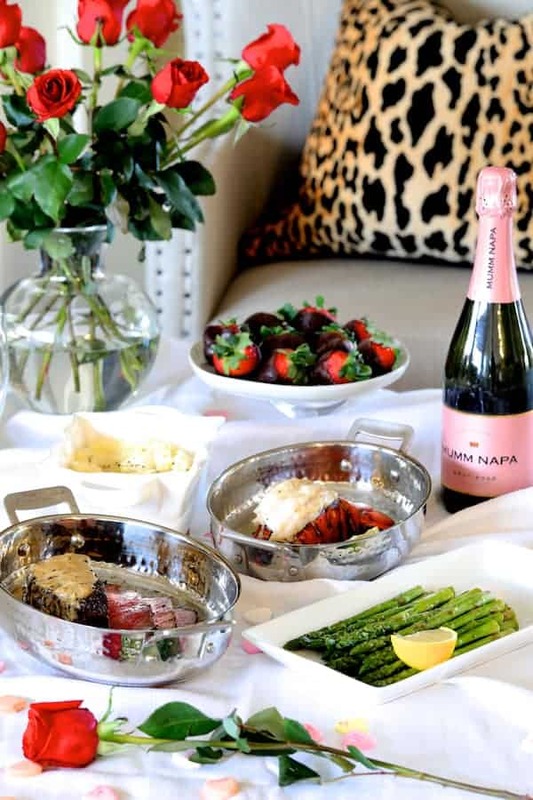 The Fresh Market's Premium Choice Chateaubriand Cut Filet Mignon and North Atlantic Cold Water Lobster Tails combine for an elegant, romantic meal you'll both love! STEAK AU POIVRE: Preheat oven to 450 degrees. Pat steaks dry and season liberally with salt. Place peppercorns in a zipper-top bag and seal. 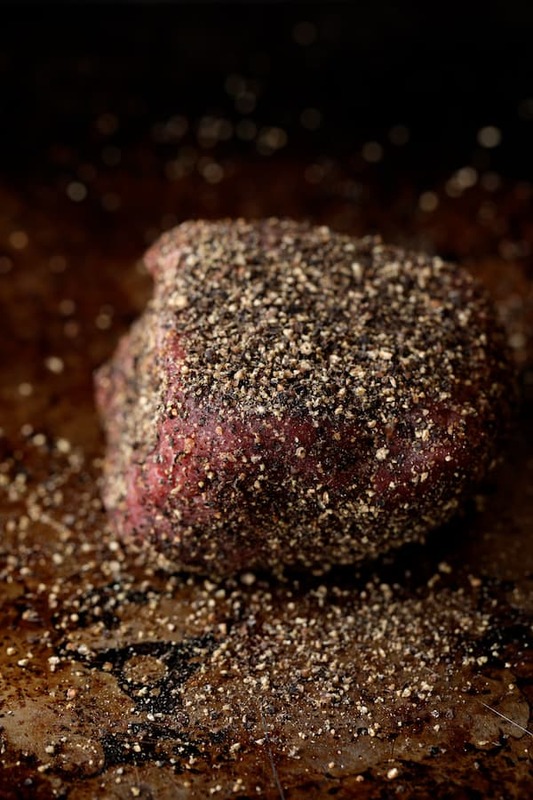 Coarsely crush the peppercorns with a meat mallet, rolling pin or heavy skillet. Alternately, use the coarsest grind of a pepper mill. Transfer to a plate. Roll filet in peppercorns so it's evenly coated, pressing them in slightly. Heat a heavy skillet over medium-high heat. Add oil and heat until hot but not smoking. Add filet and cook until evenly browned on all sides. Transfer to a small roasting pan and place in the oven. Roast for 10 to 15 minutes or until at least 130 degrees in the center for rare. Take the pan off the heat and add cognac. Return pan to heat, bring to a boil and cook 1 minute. Add beef broth and cream and cook 8 to 10 minutes or until thickened. Add Dijon mustard. Season to taste with salt and black pepper. Keep warm. BROILED LOBSTER TAIL: Preheat broiler. Combine melted butter, lemon juice and salt and black pepper to taste. Drizzle over lobster tail and place under the broiler. Broil 5 to 6 minutes or until cooked through to 145 degrees. 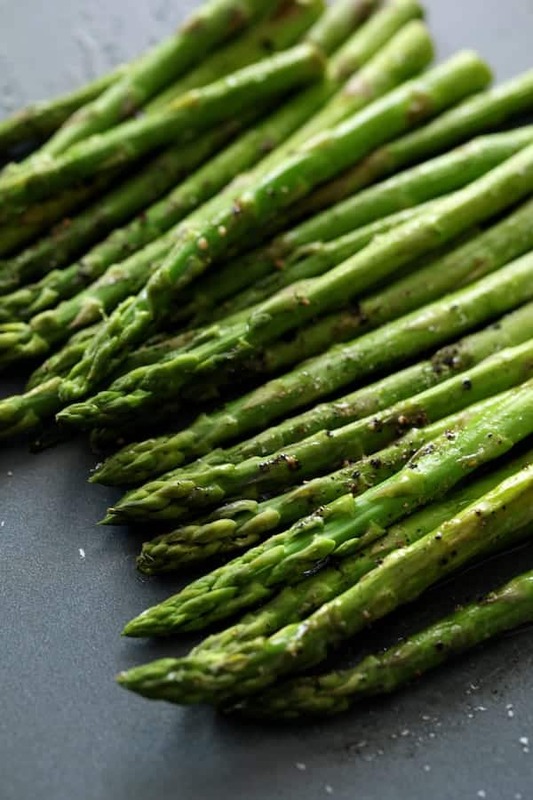 ROASTED ASPARAGUS: Place asparagus tips on a baking sheet. Drizzle with olive oil and season with salt and black pepper. Roast alongside the steaks for the last 5 minutes or so they are in the oven.